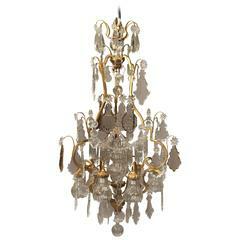 A nice late 19th century gilt bronze and crystal nine light chandelier Multifaceted and shaped crystal including half pear designs, cut crystal central column, sculpted bronze chains connecting the crown and body, nine perimeter lights. 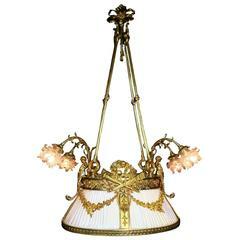 A nice quality late 19th century gilt bronze ten-light chandelier Bronze casted frame with flowers and foliate spiraled arms. 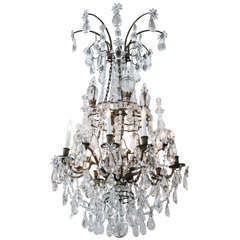 One center interior and nine-tiered perimeter lights. 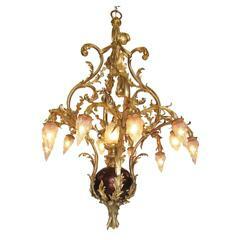 French 19th century candle light chandelier that has been electrified. 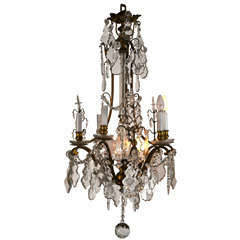 This chandelier is 45" height but can be installed at 32" with 2 links of chain and canopy. 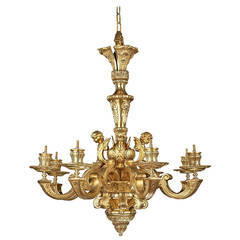 Lush, twelve light, gilt bronze and crystal chandelier with superb circlet of crystal towers featuring delicate, bronze mounts.